Differential feed, 2/3/4 Thread Serger Easy accessible treading w/ built-in needle cushion Needle Threader, swing cutter, Seam guide, thread cutter, auto tension release. same as DF554 with Fully Color Thread Knobs. 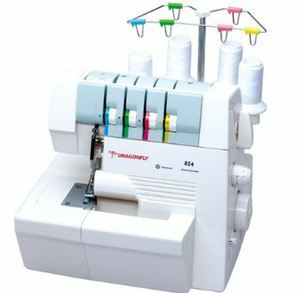 Range of 18 different types of overlock, on all types of fabrics, especially powerful motor 135W, universal automatic threading, removable sleeve panel. Differential Feed Adjustment eliminates puckering or stretching, easily adjusted from the side of the machine. From 0.5 to 1, to 2:1 ratio. Click HERE for Instructions Manual Color Pictures and Stitch Charts, but in Russian text, until we receive in English text. Overlock is equipped with a convenient storage compartment for accessories, which stores the sets of needles, screwdriver, oil can, and other necessary stuff. Note also that the overlock has a compartment for fabric scraps. The package includes overlock case that will protect your machine from external contamination during off-hours. When processing very thick materials you are using the lift lever to raise the presser foot can foot to a height of 6 mm. You may need to change the width of the buttonhole stitch from 3 mm to 4.5 mm. You also can modify their own stitch length and strength of the pressure foot. Runs 18 kinds of seams, including role-seam, abrasive, obmetochny, decorative seam Flatlock. Accessories Included: Needles, Screwdriver large and small, tweezers, cleaning brush, knife, thread unreeling discs, oiler, plastic cover, and foot pedal with power cord.. Extra Lower Fixed Knife Blade with slotted hole. Extra standard Singer upper knife blade with carbide tip is not included.